In a small mixing bowl, blend eggs, cream and Gold Label Lobster Base. In a non-stick skillet over medium heat, melt butter. Add eggs and lobster meat/other seafood, stirring continuously with a rubber spatula. 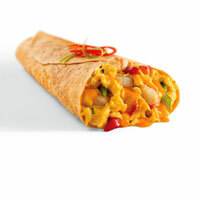 Assembly: - Place cooked egg mixture in the center of the tortilla. - Add cheese, peppers and chives. - Fold tortilla. For a Caribbean Style wrap, blend 5 mL Caribbean Jerk seasonings to the eggs and add 10 mL fresh chopped cilantro to wrap for flavor.